This book provides both an overview of the core dilemma in America--racism and the deadly impact it has had on American society--and an account of the ways in which the book's contributors have attempted to deal with this dilemma in their own teaching practice. Two core essays explore the theoretical and historical issues involved in defining "races" and "ethnic groups" in the West, and issues of racial and ethnic inequality in American society. The volume then examines a variety of strategies for "teaching the conflicts" in comparative literature and politics; African American literature; law, history, and political science; sociology; religion; economics; anthropology; and art and music. A premise of this book is that multicultural education in colleges and universities must be transdisciplinary--based on the perspectives offered by a multiplicity of interrelated disciplines. Clearly, scholars across the disciplines have a great deal to learn from one another about issues of race and ethnicity in American society. This book shares such knowledge in order to provide relevant, accurate information about these issues and their consequences for individuals living in America. It also encourages university educators to understand the challenges we face as a society and to be idealistic enough to want to draw upon the various strengths of our culture to assist in the remaking of American democracy. Contents: Preface. H. Ball, S.D. 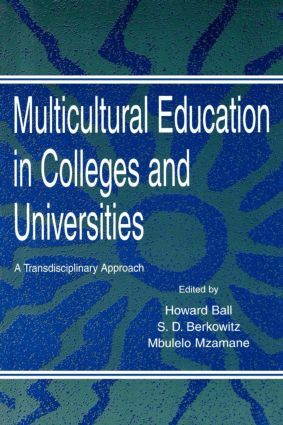 Berkowitz, M. Mzamane, Introduction: Multicultural, Transdisciplinary Education. Part I: The Core: Race, Ethnicity and Their Consequences. S.D. Berkowitz, D. Barrington, Race and Ethnicity: Intergroup Relations in a Multi-Ethnic Society. J. Loewen, The Difference Race Makes: Outcomes and Causes. M. Diouf, Teaching the Conflicts: Race and Ethnic Relations. Part II: Approaches. M.V. Mzamane, Comparative Literature and Politics: A Transdisciplinary Approach. M.J. Dickerson, Why, What, and How I Teach African American Literature. H. Ball, Law, History, and Political Science: Attacking the Architecture of Race in America--and More. N. Danigelis, Race Relations: Theory and Classroom Applications. R. Gussner, We Shan't Overcome This Way: Questions of Recontextualizing the Study of Liberal and Religious Reform Action. E. McCrate, Economic Inequality. S. Mahler, Teaching Multiculturalism Anthropologically. C.B. Rubin, Visual Arts. J. Ambrose, Music and Multiculturalism. S.D. Berkowitz, H. Ball, Conclusion: Toward a Transdisciplinary Conceptualization of Multicultural Studies.